This book includes a timely collection of topics addressing important advances in glycotechnology that are being exploited in the development of glycotherapeutics. This area is rooted in the rich history of the chemistry of carbohydrates that contributed to defining the structures of oligosaccharides and developed the complex synthesis of these exquisite molecules. In addressing the functions of these structures in animal cells glycobiologists, using the major advances in biochemistry and molecular biology developed in the last decades of the 20th century, unraveled the complex process involved in the biosynthesis, assembly, and processing of glycoproteins, glycolipids and proteoglycans. One of the seminal observations that initiated the general area of glycobiology was Victor Ginsburg’s discovery in the early 1960’s that neuraminidase digestion of lymphocytes altered their normal trafficking pattern, which ultimately led to the discovery of the animal cell lectins, and we now know that the functions of mammalian cell glycans are somehow associated with either direct or indirect protein-glycan interactions making them ideal candidates for glycotherapeutic studies with many examples already available. The obvious challenge now resides in the continued search for the roles of glycans in normal physiology and disease; and these advances a coming rapidly in the field we now refer to as Glycomics, which has recently been recognized as a strategic area for NIH Common Fund support. The future is indeed bright, and the opportunities are ripe for the investigators to exploit this rapidly expanding area for glycotherapy. There are many therapies being developed through biotechnology for treating diseases. They include protein therapy, gene therapy, cell therapy, and glycotherapy. As one of the important disease treatment approaches, glycotherapy provides solution for some unmet medical needs using glycoengineering. It has been used in clinics for decades. Heparin, a glycosaminoglycan and blood thinner, acts as an anticoagulant and is one of World Health Organization's lists of essential medicines. The sialic acid analogues, oseltamivir and zanamivir, are widely used anti-influenza drugs. Polysaccharide vaccines including Menactra, Prevnar, and Typhim Vi, have been used to stimulate immunity against infection. In addition to therapy using sugar or sugar analogues, therapeutic proteins, such as darbepoetin alfa and imiglucerase, are also generated using glycoengineering in vivo or in vitro to enhance therapeutic index. During the last two decades, significant progress has been made in glycotherapy with glycoengineering and glycan mimics although there are many challenges. The glycans are chemoenzymatically modified or conjugated to small molecular weight drugs, proteins, and nucleic acids for increasing pharmacokinetics and pharmacodynamics. Although there is an excellent review published recently by Hudak and Bertozzi (Chemistry & Biology 2014), glycotherapy has not been extensively appreciated in books and unknown to many readers outside this particular field. The current book attempts to fill the gap and provide more recent information related to the exciting progress in this important area of biotechnology. The book includes reviews on glycotherapy which focus on modification of protein or small molecular weight drug using recombinant and chemoenzymatic approaches. The progress on bioconjugation of glycan using hydrophilic polymers is also covered. Chapters 1 and 2 focus on the development of vaccines and antibodies against tumor-associated carbohydrate antigen for cancer treatment, as well as the use of glycan for viral inhibition. 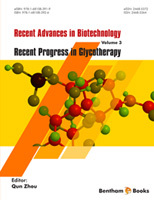 Chapters 3 and 4 describe the progress in glycoPEGylation and hyaluronic acid conjugation for increasing therapeutic index in treating diseases. The glycoengineering of therapeutic proteins is reviewed in chapters 5, 6 and 7. They provide overviews of recent advances in modification of glycans in proteins or antibodies using recombinant, chemoenzymatic or bioconjugation methods. Although only a few topics of glycotherapy are being reviewed here, this book aims to provide readers with overview of the researches which have been actively pursued during recent years. We expect to have more excellent books or reviews on this important therapeutic area in the future. Biologics and Vaccine Development, Merck & Co., Inc.
FBCB. Edificio FBCB-Ciudad Universitaria UNL. C.C. 242. (S3000ZAA) Santa Fe.